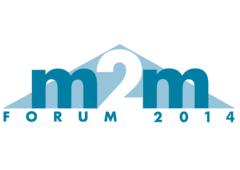 Vertical M2M will exhibit at the next M2M Forum, at the Congress Center of MilanoFiori (Milan, Italy) on May 20th. The show is dedicated this year to Internet of Things, Smart Cities and smart grids. Vertical M2M will present its new solutions in Energy and Remote Automation based on its M2M services platform CommonSense. Maurice ZEMBRA will speak during conference sessions on the theme: "From SmartHome to SmartBuilding, innovative strategies and technologies Energy management for SmartCities".